President Obama made a case for the future in his State of the Union address. But does his focus on economic leadership and innovation ring true? Our expert contributors offer insight. Listening to President Obama last night, I wondered if his speechwriters had been reading Stephen Johnson’s new book Where Good Ideas Come From. When the president talked about the unexpected nature of innovation, he was channeling Johnson. • We Do Big Things. Really? • Where Do We Need Innovation? • Can America Compete Against a Rising Young World? • State of the Union: Out-Innovating? 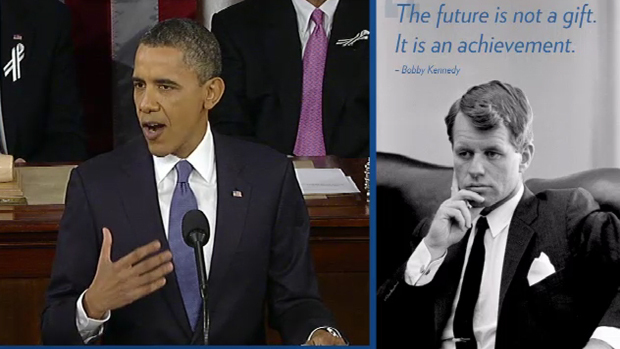 Three words rang out during the President’s address: Out-innovate. Out-educate. Out-build. Were does that leave us? To focus on the President’s agenda of clean energy and education is to miss a subtle insight into Obama’s skill as an innovator. You see, Obama knows a secret. Steve Jobs knows it too. The secret is that people don’t think; they react. Congress decided to “mix it up” for the State of the Union address, to sit together instead of opposite sides of the aisle. It was even referred to as “dating,” and fraught with the same social complexity and awkwardness teenagers encounter. This seemed like an empty gesture, but I was quite surprised by the outcome.